You often hear comments from men about how much easier it is to care for themselves now that they have freed themselves from the hair on their head. And while I’d agree that it may simplify a few steps in the morning, it by no means releases us from the ritual and maintenance of the delicate skin on your noggin. ‘Who you calling delicate,’ you grunt? Your head. You see, your hair had purpose when it was on your head, including to protect your skin from the damaging rays of the sun, to keep it clean, moisturized, cooler in the summer and warmer in the winter. And while a hat may be the best way to keep warm, it takes a bit more creativity to accomplish the other four important tasks. To learn how to accomplish this like a pro, I turned to two new products from the experts of hair-free heads… HeadBlade. This summer they released their all new HeadShade SPF and HeadWipes, both of which impressed us equally. 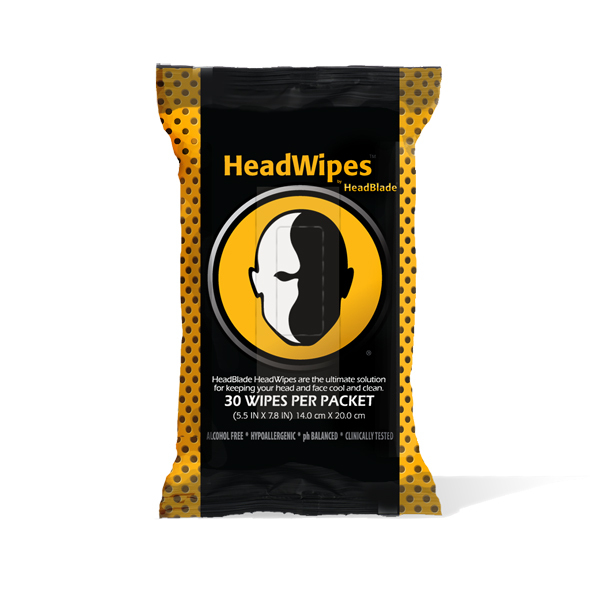 The HeadWipes are an ‘on-the-go’ package of moist towelettes (30 in each pack). All you do is pull one out, wipe your head down and get on with your day. That is the simple description. The more detailed one describes each wipe as pulling out toxins and dirt from the scalp while releasing vitamins and moisture from its infused aloe, green tea and cucumber extract. As an added bonus, not only do these work great on your face too… they also bring a tingling sense of coolness to your skin during a hot afternoon. In fact, I found myself using two towelettes per day, one to clean up in the morning and the other to cool down during the mid-day. All-in-all I thought these were a great idea, packaged smart and are offered up at a very reasonable price of just $5.97. 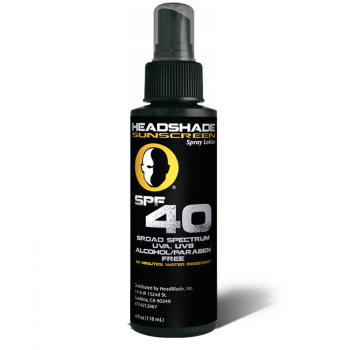 HeadShade SPF should be another important part of every bald man’s grooming regimen, and that is especially true if you’re regularly out in the sun. If you’ve seen the damage sun can do to an unprotected face, just double that to understand its capacity to damage the top of your head. And while we are not huge fans of the typical SPF creams and gooey gels, the HeadShade SPF 40 just sprays on, leaves no greasy residue and feels cool as an added bonus. And it does a great job of blocking out the bad spectrum of the sun. I tested this during the hottest part of the Utah/Nevada summer, which was gruelingly hot for those who were nestled in some of the cooler areas of the US. However, despite the odds it had against it, the HeadShade SPF proved itself worthy. In fact, I just kind of forgot about it until I got home later in the day and realized I had no sunburn to tend to. So then I’d just add a few more spritz’s… and head (no pun intended) back out. You’ll find the HeadShade here. 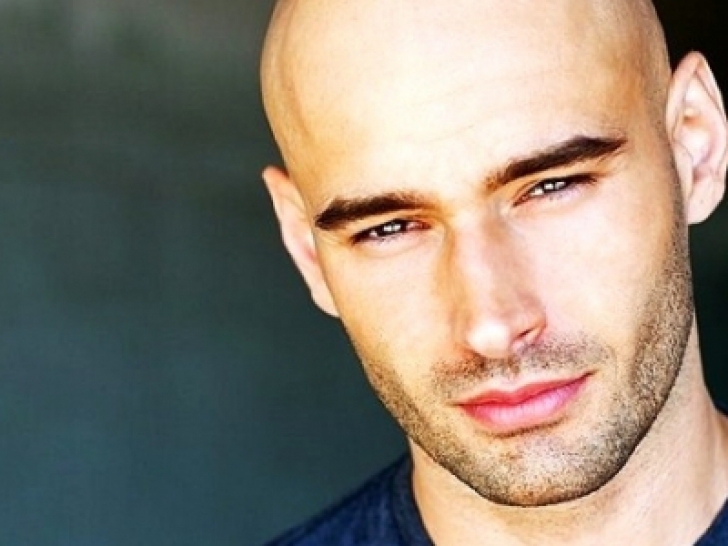 There are a lot of skin products on the market designed specifically for a man’s delicate (or not so delicate) skin… but only one that we’d trust to a bare head? HeadBlade.